Snowboarding has evolved as an extreme sport over the years. The tricks are getting crazier, the jumps are getting bigger, and the speed is increasing. How is it that this extreme sport is year after year getting more extreme? By reforming the learning process of snowboarding itself! Everyone is learning the fundamentals quicker and easier, allowing them to progress faster. Professionals once started out as beginners, and they had to start somewhere. They laid a solid foundation that enabled them to skyrocket their skills. That’s what this guide is all about! By laying a solid foundation for snowboarding, you can learn much faster. The techniques taught in this guide are the latest, most up to date techniques taught to beginners. With you in mind, we’ve put together a step by step guide that will walk you through each essential part of the fundamentals of snowboarding. With our latest walkthroughs, you’ll feel like snowboarding is embedded in your DNA! In this guide, we will show you how to kick start your snowboarding career and shred the mountains. You’ll be able to learn tricks faster while staying safer on the mountain. 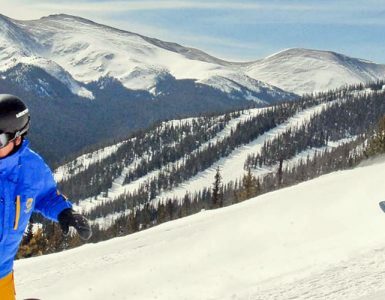 We’ll also teach you proper mountain etiquette and tips such as how to put your gear on correctly, how to approach the ski lift, and how to be courteous to other riders. Learning these fundamentals will help everyone to have fun. How can a guide teach me how to Snowboard? In this guide, we break every process down step by step. That means by the end you’ll have a system that you can follow to eliminate the guesswork. Like any other task, having a system will allow you to analyze what you are doing to see what you need to improve. But, just like snowboarding, this guide will be fun to read. We’ll keep you on your toes while you learn how to crush it. By the end of this guide, you’ll be a master in the basic techniques of beginner snowboarding. You’ll approach the mountains with confidence. Enough talking about what this guide can do; let’s start learning how to shred! Before you get out on the mountain, you’re going to need a few of the essentials. These items will ensure you have the most fun while staying safe. Don’t just run out to the mountain in your cotton sweatshirt and jeans...you’ll freeze to death! You want to make sure you’re warm and dry so that you can get the best experience possible. The less you have to worry about how cold you are, the more time you’ll have to focus on getting better! When looking for clothes, the obvious choice is snowboarding gear. However, there are many different kinds of material, thickness, and styles being used. It is important to know which one will suit you best. While polyester is the base for most garments, it isn’t always the most resistant to water when it comes to regular apparel. It is, however, much better than cotton. The denser the polyester, the more resistant it is to water. Some snowboard gear will be coated with a water repellant solution, which will prevent any rain or snow from seeping into your gear. It is important to know that there are ratings to how water resistant material is, and you should be able to find that information on the product label. Opt for at least 10000mm rating to ensure a safe, dry experience. Nylon gear is exceptionally strong and a favorite among snowboarders. That is due to its’ water resistant abilities, along with the characteristics that make it robust and elastic. Nylon is very easy to wash. Just like polyester, nylon should also be coated with water repellant to ensure full protection. Depending on where you are, and what conditions you are facing will determine what gear you will need. A good water repellant outer shell is the first priority when it comes to staying warm on the mountain. Opt for a heavier jacket if it is going to be colder, and a lighter jacket if it will be warmer. As the season winds down to an end, some snow days can be quite hot. Do your research to find out what temperature you will be facing, and purchase gear that fits those needs. Now that we have covered the outer shell, let’s move on to the mid layer. As was said before, it is important to know how cold it will be before selecting which type of gear to go out with. Generally, a mid layer will be needed for temperatures around or below freezing. The important thing to note here is you will need to trap heat while also ventilating. This will prevent your body from getting too hot and sweaty, creating a nasty mess out in the snow. Although many companies try to mimic down feathers with synthetic material, there has been nothing like it. If you are looking to protect yourself with a well-designed equipment, down feathers are the way to go. They will trap your body heat while ventilating so that you sweat less than you would with a synthetic. We’ve worked backward on this list just in case you’ve decided to skip ahead to the store and purchase stuff before reading the whole section. The base layer is pretty flexible, as long as you have a water repellant outer shell and a mid-layer keeping the heat in. Base layers should be a breathable fabric that traps sweat and moves it away from your body. This is why having a down feather middle layer is important because it will take that sweat and ventilate it out while keeping you dry and warm. When selecting a base layer, wool is highly recommended. The properties of wool will keep you warm even wet. They are starting to create wool fabrics that aren’t itchy, so don’t worry about that too much! Merino wool will provide you with the protection you need without the itch. If you are allergic to wool, a close second is a synthetic material made with polyester. It doesn’t have the same heating properties when it’s wet, though, so be wary of that. The important thing about the base layer is to make sure it fits well. A tight fitting base layer will ensure your sweat will be wicked away from you, keeping you extremely warm. Underwear. Any underwear made of synthetic material will help you stay dry and prevent chafing. Merino wool is also an excellent choice for underwear material because of its wicking and warming properties. Lastly, a treated silk pair of undies can also provide some wicking while feeling super comfortable. A general rule of thumb is the warmer the day out, the looser your underwear should be. Socks are also an important factor when choosing your snowboarding gear. Wool is also an excellent material because of the wicking and warming properties it has. You’ll want a thicker sock to ensure your boots will be comfortable while you spend the day out on the mountain. Gloves are important, as you’ll certainly want to have them on the mountain. It is a good idea to purchase gloves that fit you well while keeping your hands warm. Functional gloves are much easier to put your boots and straps on, and they prevent you from having to take them off and freeze your hands! That is why it is recommended to use gloves instead of mittens. When riding, a helmet should always be considered. If you have ever been in the snow, you’ll know that it isn’t always soft! Protect your head from injury and maintain a safe riding experience. Googles. If you are going to be riding in fresh powder, or if it will be raining or snowing during your session, you should opt for goggles to go along with your helmet. This will protect your eyes and allow you to see better in the harsh conditions. If it is a lighter day out, sunglasses are recommended. The sun can really get to you when it reflects off the snow! You’re now properly equipped for the cold conditions of the mountain. Now it’s on to the fun stuff; selecting your board. When you’re first starting out, you’ll want to get a board that suits you. There are so many boards out there that it is almost impossible to choose. But, there are similarities you should look for when selecting a beginners’ snowboard. If you are a true beginner, it is best to talk to a local snowboard shop and see what they recommend. It may also be wise to rent a board a couple of times just to see how you feel on it. Most shops will allow you to rent both beginner and intermediate boards of many different types. Try a few out to truly make sure you know what type of board works best for you. We’ll guide you through some of the steps when picking a board in the next few sections. We’ll provide you with some basic terminology for selecting a snowboard, and then provide you with the specs we think will suit beginners well. Let’s start with camber and rocker. Camber and Rocker are different ways a board is shaped. Camber provides a stable ride while allowing you to power down groomed sections of the mountain. They will have rounded shapes under the foot bindings. You’ll be able to catch speed easier with a cambered board. Rocker is better used in fresh powder or when riding rails in the park. These boards are shaped like the mouth in a smiley face. They offer a much softer ride, and for this reason, it is recommended that beginners start here. There are boards out there that are created with mixed camber. There are tons of different options, and each manufacturer creates mixed Camber differently. If you’ve tried out both sides of the spectrum and can’t decide, a mixed Camber board might be for you. Check out the specs of each individual board to see what it truly delivers. When it comes to the length of the board, a general rule is that when you stand the board up next to you, the tip you be somewhere in between your chin and your nose. If you are looking for a faster ride, you should opt for a longer board. If you think you’ll be hitting the parks more, a shorter board is easier to maneuver to all the jumps. This is your typical, mountain trekking board. It is a jack-of-all-trades style board. For this reason, many riders opt for this style board. It can suit your needs while you’re riding down the mountain, or even do fairly well in the park. If you are looking for a beginner board, this style is the one to choose. These boards are for those who fell in love with the parks and never want to leave. You want to stay on all the jumps, rails, and pipes, and do it with style. 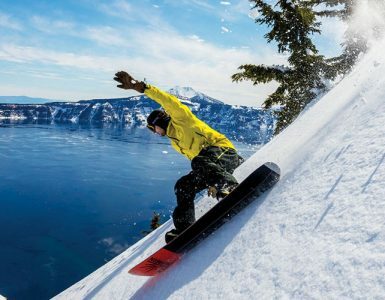 These boards aren’t meant to go as fast as all mountain snowboards, but they can handle well. If you are looking for a slower ride or an intense park session, the freestyle board is the way to go. Again, selecting a board comes with many different options. There are tons more specs not mentioned here that you can get picky with. The general idea is to choose a board with the proper camber and rocker for your riding style (mountain or park), and choose a length that will suit you. When selecting a board, it is best to consult someone who works at a shop to get a board tailored specifically for you. Select an outer layer that is extremely water repellant. Select a mid-layer made of down feathers for best performance. Select a base layer and underwear that is synthetic, allowing moisture to be wicked away. Gloves are much easier to use than mittens. All mountain boards are faster, have more camber, and are meant to be the jack-of-all-trades. Freestyle boards are often shorter, have more rocker, and are best in the park sections. When in doubt, speak to an associate at the nearest snowboard shop for gear tailored to your needs. A quick note about learning how to snowboard: the more you practice, the easier it will be. This is the same with learning any skill or sport. Reading this snowboarding guide will give you the knowledge to perform like a pro, but only you can go out there and practice! Be sure to read this guide with the goal of taking away actionable steps you can learn from. Now that we have all the gear we need, let’s head to the mountain! 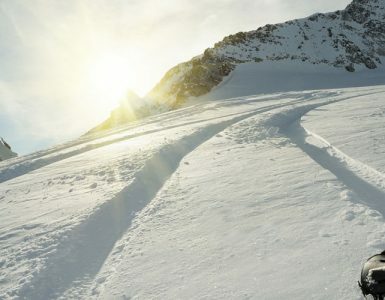 To start snowboarding, you will need to find a downhill slope of some sort. If you want to practice before heading to the trails, start on somewhere less steep. Oftentimes the trails will include a bunny hill for beginners. This is where you should start. Once you’re strapped into your board, you might feel a little awkward at first. You can’t move your feet as freely because they are connected to the board. When you’ve gained some sense of balance, start facing toward the slope. You’ll start sliding down. Try to slide your board back and forth under your feet to get a feel for the board. Try doing this at least twice, once with each foot towards the front. If you find that you’re left foot feels more comfortable towards the front, you ride regular stance. If your right foot is more comfortable in the front, you ride goofy stance. When learning the feel for the board, it is often best to pick a spot that is out of the way. That way all riders can continue with their sessions while you stay safe and uninterrupted during yours. Once you get the hang of it, you’ll want to start going down the bigger slopes. The trails will be marked for beginners, so choose the next one up. Remember to be aware of your surroundings at all times, and pay attention to riders around you. Listen for them coming down the hill, and watch to make sure you aren’t running into anyone. The safer you are, the more fun you can have! Now that you’ve got a feel for the board, you are going to need to learn how to stop. This can be very crucial to learn, as it will prevent you from riding down the hill at speeds that are too fast for you. To find out how to stop, simply slide your back foot forward so your toes are facing downhill. While doing this, rotate your body the same way. The goal here is to have your board and body perpendicular with the slope with your body facing down the slope. Once you are comfortable stopping with your body facing down the slope, it’s time to learn how to stop with your body facing up the slope. To do this, simply rotate your body and slide your feet so that your body is facing up the hill and your heels are facing down it. You’ve done it! Now that you’ve mastered stopping, let’s learn how to gain speed. You might get yourself into a flat spot sometimes. If this is the case, a small hop forward might be all you need to get going again. When going downhill, you will go fastest when your board is parallel with the slope. That means that both of your feet are in line with the downhill slope. In order to gain even more speed, try not to move back and forth. When you are barreling downhill and want to go faster, you need to bend down. This will push all the weight down on your board, allowing you to fly down the mountain. It is important to work your way up slowly, practicing your stopping and carving. In order to carve back and forth, you’ll do what feels like half a stop. To perform a carve, move your back foot in either direction while turning your torso and arms in the same direction. While doing this, keep your front foot straight. When you are ready to carve the other way, jus do the opposite. Keeping your front foot in place while rotating your back foot and body back in forth will allow you to carve down the mountain like a pro! Once you’ve started getting the hang of riding in your normal stance (either regular or goofy), it is time to start riding switch! Learning this early on will allow you to learn tricks easier. In order to perform this maneuver, start going down the mountain in your normal stance. Then, rotate your back foot and body 180 degrees so that your feet switch. If you were riding regular, you would now be riding goofy, and vice versa. This will feel a little strange at first, but the quicker you learn how to ride like this in your snowboarding career, the easier it will be to learn switch tricks later! When you are ready to ride normal again, simply rotate your back foot and body 180 degrees again and keep barreling down the mountain! You’ve started to learn some basic tricks, including carving and riding switch. You’ve learned how to stop and ride faster, and now you are looking for more. Once you feel comfortable with your snowboard, it’s time to move on up the mountain. So get in line and hop on the ski lift! Green Circle - These trails are one step up from the bunny hill. They have a little more slope to them and are generally longer than the bunny hill. Almost all beginners should start here. This is because they are usually very wide and groomed well. Blue Square - These trails are considered intermediate. The nice thing about these trails is once you get the hang of the green circles, you can move up to these without skipping a beat. And, they are extremely fun for people who want to have fun and aren’t looking for too much of a challenge. They are generally a little steeper than green circles. Ready for the real deal? Try the black diamonds. Black Diamond - This is an advanced trail, and you shouldn’t ride on these until you are extremely comfortable with blue squares. They will be a challenge, as they are much steeper than the easier courses. Approach these with caution, as you don’t want to be tumbling down the hill! These trails are usually quite narrow and ungroomed, so watch out for hazards. Double Black Diamond - Even harder than black diamonds. Only experts should attempt these. Trails like this will likely contain drop-offs, so be prepared for a slight free fall. These trails are also very steep, narrow, and ungroomed. It is important to move down the list according to your skill. Do not move straight from the green circle to a black diamond. This is very dangerous, and you should always pay attention to trail signs when attempting to go down the mountain. If you happen to go down the wrong path and don’t feel comfortable riding down, immediately stop. Move to the side of the trail to avoid any collisions with other riders and walk down. It is better to be safe than attempt a trail you aren’t ready for. So you’ve figured out the basics of your snowboard and are looking for more. Now it’s time to learn some tricks. If you like, you can head over to the park section and start there. But, if your mountain doesn’t contain a parks section, there are many tricks you can learn too. The first two tricks you should learn after you’ve started to master your basic snowboarding skills is the press and the ollie. Basically, the press is when you put all of your weight on either of your feet and lift the other off the ground. This will allow half of your board to come up off of the snow. Learning the press will help you to balance better on your board and prepare you for the ollie. The way to learn an ollie is very similar to a press. To start, lean back and put all of your weight on your back foot, similar to press. When you do this, bend your back knee. As your weight settles on the back foot, spring yourself up into the air. Once you’ve nailed that trick, you can move on to more technical tricks involving the skill of an ollie. Learning how to 180 is quite simple once you know how to ollie properly. When you are preparing for the 180, it is best to learn frontside 180’s first. That means that you will be spinning by kicking your front heel clockwise if you ride goofy and counter-clockwise if you ride regularly. Frontside 180’s allows you to spot your landing the whole time you are in the air. When you bend your knee during the ollie and spring forward, rotate your body while kicking your heel out. This trick is much easier if you already learned switch. Once you’ve nailed the frontside 180, it is time for the backside. This trick is easier to maneuver because you can use your toes to jump, but harder to land because your back will be turned away from the landing. The backside 180 is done exactly like the frontside, except you will be turning the opposite direction. That means if you ride goofy, you will be kicking your front foot counterclockwise. If you ride regular, you will be kicking your front foot clockwise. Once you’ve nailed those tricks, it’s time to move on to some harder ones. Jumps can be extremely fun once you’ve learned them. They can also be kind of a pain to learn at first. If you’ve got your ollie down, you should have no problem at all learning how to land jumps. The important thing to remember about jumps is that your body is facing sideways when you snowboard, and you should land that way in order to ride away safely. If you try to correct your body and land facing forward, prepare to eat snow! Once you get that in your mind and remember it, you should be ready to approach jumps with ease. For starters, head up to a small jump. Try to gain a little speed and bend your knees as you approach the jump. Spring yourself up a little once you’ve started to go off the ramp. Make sure to keep your weight balanced over the board and don’t turn your feet! Spot your landing and bend your knees as your board touches the ground. Voila! You’ve just landed your first jump. As you get better at jumps, you’ll want to progress onto bigger ones. Practicing going faster and jumping higher on jumps to get a feel for them. Once you’ve started landing consistently, it’s time to learn the 360. Now that you have learned the 180, it is time to make it around a full circle! A 360 is very similar to an 180, except you’ve got to spin a little faster and jump higher. To make things easier, it is best to practice on a medium-sized jump. That way you’ll have enough pop but won’t crash too hard if you fall. If you’ve never ridden on a jump before, it is best to ride straight off a few times to get the feel. When you get comfortable, wind your body up the opposite way you want to spin, approach the jump, and spin once you’re in the air. If you want to spin to the left, wind up to the right. This will provide you with some momentum as you release your body into the spin and get you around quicker. On your way down, spot your landing and ride away. When you’ve learned how to spin one way, try it the other way! While you’re in the areas with jumps, better learn an indy grab! This trick is an excellent beginner’s trick because it is only one step further than just riding off a jump. To perform an indy grab, reach down and grab the middle of your board with your back hand while bending your knees in mid-air. That’s it! It’s basically like reaching down and touching your shoe but in the air. If you’ve learned how to land jumps, you’ll have no problem with the indy grab. When you’ve started to progress and get a feel for your snowboard and some of the basic tricks, you may want to know how to improve your skills further. Practice does this. The more you’re out there practicing your tricks, the more comfortable you will be on your board. While you’re at it, meet some friends on the mountain and challenge yourself to do some tricks they know. It is always a blast to go out there with your friends and learn a new trick. Sometimes you’ll be out there for a while and just feel like you can’t figure anything out. Or maybe you’re not comfortable on a snowboard at all. If this is the case, you might want to take snowboarding lessons. Snowboarding lessons are an excellent way to get hands-on experience and have a coach teach you the things you are lacking. Snowboarding lessons can be extremely expensive, and in most cases, this will guide you through everything you need to know to master the beginner tricks. It helps to read the section a couple of times over, and even visual what is going on in order to really see yourself performing the trick. Remember, snowboarding is a tough sport, and no one learns overnight. The bottom line is that you have the knowledge it takes to master the fundamentals of snowboarding. So go out there and shred!